My grandma makes the best popcorn cake! It’s so good that many of us get a fresh one from her kitchen as a Christmas present. I’m pretty sure that my dad and I could eat an entire popcorn cake in an evening. 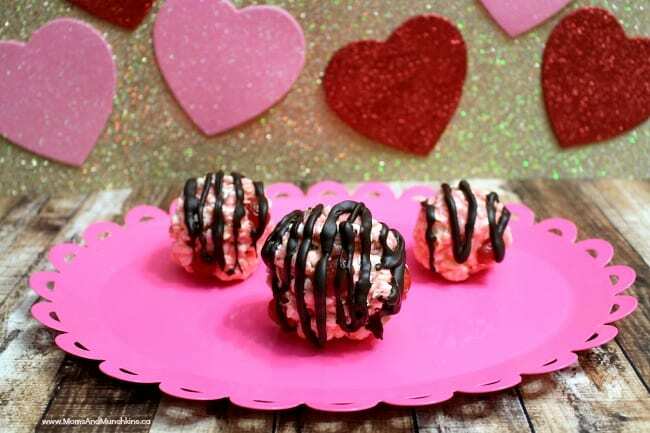 For Valentine’s Day, I created a fun twist on her traditional recipe with Chocolate Strawberry Popcorn Balls. They are a big hit here and I hope you love them too! You’ll want to start with Grandma’s popular popcorn cake recipe featured here. Instead of using plain white marshmallows, I purchased the mini colored marshmallows and picked out the pink ones. Yes, a little time consuming but they have a sweet fruity taste that helps give these that strawberry taste. Not enough pink marshmallows? Add some of the orange in there as well. I only made a few popcorn balls so I only made a quarter of the above mentioned recipe. It makes about 5-6 medium-sized popcorn balls. Instead of jujubes, I used strawberry flavored fruit snacks. Also, I didn’t mix them into the recipe like you do with Grandma’s traditional recipe. I just stuck them to the outside of the popcorn after I shaped them into balls. Once you’ve shaped the popcorn balls, wrap each one individually in plastic wrap (tightly) and place in the fridge for about 10 minutes so they harden a bit and hold their shape. While those are in the fridge, melt about 1/2 cup chocolate chips in the microwave. Melt them on 30 second intervals and stir well between each set. You want these just melted slightly. If they are too hot, they’ll be too runny. Put the melted chocolate in a sandwich bag and cut off a very small corner of the bag. 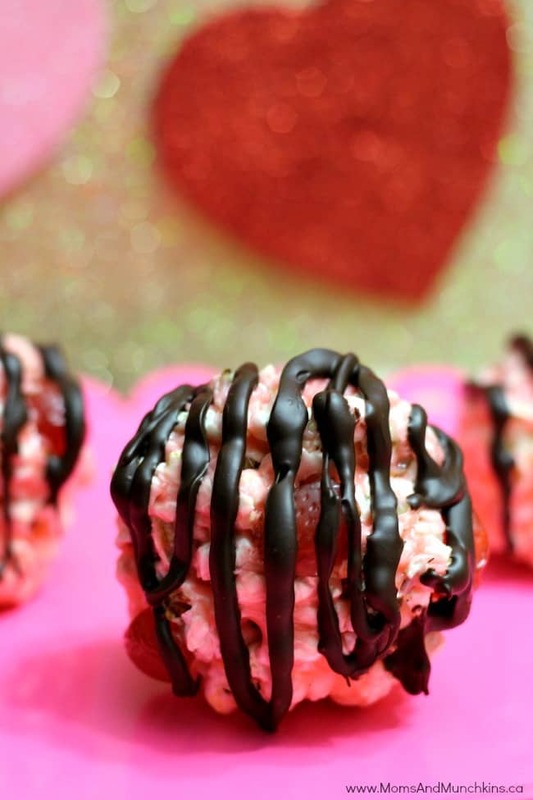 Take the popcorn balls out of the fridge, unwrap them and drizzle each with chocolate. Put them in the freezer for about 10 minutes so the chocolate hardens. Store in the fridge – if you have any left! For more delicious ideas for Valentine’s Day, visit our special Valentine’s Day page. WOW! What a DELICIOUS treat for Valentine’s Day! Thanks for sharing on Thrifty Thursday Cheryl! These little popcorn balls look amazing….not to mention so incredible yummy! Thanks for sharing! PINNED!